While it used to be considered revolutionary and new, the marketing technique of taking unknown people and converting them, bit by bit into buyers – and even evangelists – for your products or services is now considered a best practices approach to building almost every business. Essentially, every potential client – or visitor to your website starts at the top of the funnel, circling it’s wide opening. Then, if you’re doing your job right, the people you can best help start moving deeper and deeper into the funnel. It’s not a perfect analogy: the sales funnel has more leaks than the one you use to refill your BPA free water bottle, but it’s a pretty good visual for how the process works. You make potential buyers AWARE of your product or service and its value. The prospect CONSIDERS buying from you and/or others. 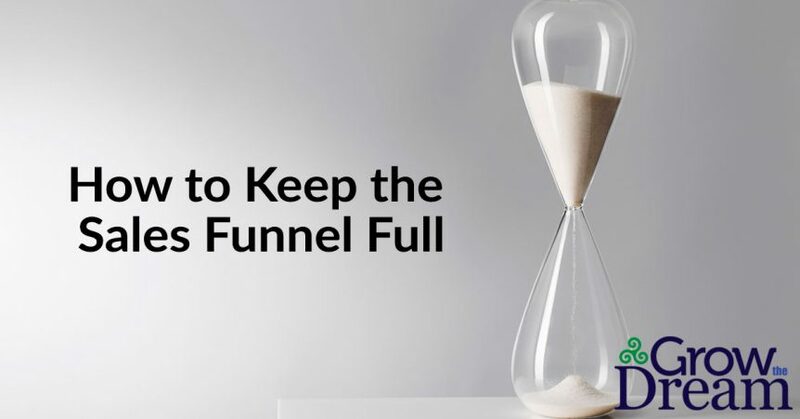 But to properly implement the funnel – and keep it filled up (did we mention the leaks?) – you need a better understanding of the sales cycle, how long it takes to move a random stranger who visits your website into a source of positive feedback, and how many you need to keep “in the hopper,” so to speak, to make your business successful. Online sales can be both simpler and more difficult. Simpler in that a lot of the steps are abridged, if you and your business are properly prepared for them. More difficult in that you have to be properly prepared – and that takes a bit of hard work ahead of time to design the process. The good news is there are tools to help streamline and automate the process. And the automation, once created, will not only make the end of the sales cycle more straightforward and profitable, but will provide the data that will help you continuously improve and even shorten the sales cycle. So we start with number one – everyone needs to prospect for leads, right? Well, while it never hurts to apply traditional lead seeking to an online business model, just doing that is going to leave a lot of prospective customers out. One of the main purposes of generating leads online is that it allows you to reach beyond the borders of your community, city, county or state. Online businesses can reach customers all across the nation – and even go global, if their product and service is valuable to people outside of their known areas. The beauty of the Internet and having a properly executed presence that draws in traffic from search engines is that the customers come looking for you, not the other way around. Steps 2 through most of 5 are easily combined. In most cases, you don’t set appointments, the prospect comes looking for you. Then, if you’ve done your strategic work and identified your ideal target customer, the presentation and the qualification are handled on the landing page, particularly if you have a well-designed and laser-targeted Lead Magnet. Additional objections should be covered by your online FAQ. And, again, if you’ve done the strategic work, you already know the questions they’re going to ask and can address them even before they hit the FAQ. Closing the sale – this is going to be different for every business, but obviously essential. If you don’t close the sale, you don’t make any money, and you’ll be among the majority of businesses that fail in their first 2-5 years of operation. Asking for referrals takes on a new hue in an online business. Yes, you can still ask for straight up referrals, but these days, an even more powerful and longer-reaching solution is to ask them for positive feedback. Check out this post for tips on how to get your customers to tell their positive stories online. Another common thread we’ve found with businesses that are successful promoting online is that instead of focusing more on one transaction per customer – like a car or appliance salesman – these businesses tend to do repeat business and do it more often. So you’ll also want to be even more aware of what Tom Hopkins calls ‘the itch cycle’ of your target clients so that you can stay in their minds when the time comes for them to need your services again. To accomplish all this – and make sure you’re both on the right track and accurately judging the length of the sales and itch cycles for your business, product and services. That requires you to set Key Performance Indicators or KPI’s. KPI’s are sales metrics that give you a benchmark to shoot for. One that is, at least partially, based on your ideal target customer, their needs and the frequency of their need arising. If it sounds like I’m repeating myself, it’s because we’ve learned that certain concepts need to be reinforced in slightly different language to fully connect with our audience. You might have noticed I’ve mentioned strategy several times. Remember that part about “the hard work ahead of time” to design the most effective process? It starts with and hinges upon strategy. Your business – online or not – needs to build out a unique set of specifications to describe what a properly qualified prospect looks like. I’ve referred to it a few times earlier as your ideal target customer. And let me reiterate that the more information you know about this ideal customer, the more effective your well-designed sales process will be. By utilizing the automated tools found in Infusionsoft or other similar products, you can strike while the iron is hot, continue to gather data on and refine your definition of your perfect customer, and measure the KPI on every point of interaction as you guide the people from stranger to prospect to buyer. This happens because Infusionsoft and a few other customer relationship management (CRM) software systems allow for the movement of prospects through your sales stages, while tracking the time and effort required to move them with a reasonable degree of accuracy. While automated systems make it easier to manage and communicate with your prospective clients on a regular basis, it needs to be properly designed. Depending on where a person is in the sales cycle, they have different expectations for communication. If they are early in the cycle, they may not be qualified, and are probably just doing research. Just like a window shopper who responds to the pushy sales clerk that they’re “just looking.” Your goal is NOT to be the pushy sales clerk. Again, a laser-focused Lead Magnet allows them to qualify themselves, AND offer you the chance to invite them back without feeling sales-y. Instead, you carefully shepherd the potential client into more trust and interest with carefully timed emails, social media interaction, success stories, videos, other customers’ positive feedback and offers, especially for helpful webinars or white papers that position you as not just a salesperson, but an educator. And with each step your prospective client descends, they’re further qualifying themselves. Then once the prospect gets deep enough into the sales cycle, you’ll want to be highly responsive help to complete the purchase. If you come on too strong too early, or not enough too late, both lead to buyer frustration and sayonara to your sale and future business. And don’t forget that all-important post-sale follow-up to ask for their positive feedback. All the while tracking their movement with a CRM and using that data to improve your process. Yes, I said improve your process. While building a well-designed sales cycle tracking and follow-up system leads to more efficiency and profitability, you can’t rest on your laurels. The point of creating the automated funnel is not to sit back and just gather in the profits. It’s to make your business and system more workable so you can spend more time developing the business – and hopefully, more time resting. I know it’s odd to think of an entrepreneur resting, but quality of life is important too. Do the heavy, strategic lifting on the front end, and it’ll be easier to make sales and tweak the process as it goes, so that you’re not just growing your dream business, you’re nourishing your dream life as well.